I can no longer bear to watch rugby union, the sport I played for three decades. It's become too violent, too vicious, and the sight of players stretchered off senseless is too commonplace. So are the deaths. Six last year: three Frenchmen, a Canadian, a South African and an Italian woman. The youngest was 17, the eldest 31; six players who lost their lives because the collisions in rugby are now so ferocious that the human body can't cope. The statistics bear it out. As the Times reported last month, 'Severe injuries were at their highest since records began in 2002', with the incidence of head injuries of particular concern. And, as the Sunday Times reports today, Six Nations players are now three stone heavier than they were in 1955. Players in their prime are being ordered by doctors to quit the game to save their brains, and others, like the former Wales and British Lions captain Sam Warburton, have been forced to retire because their bodies are broken. Warburton, 29, called it a day last year after suffering 20 major injuries in eleven seasons. His jaw, knees, neck and shoulders have all been remodelled by surgeons. Rugby union is in crisis and this could be its make or break year. The international season begins shortly with the start of the Six Nations, an appetiser to the main event in September, the ninth World Cup. The first in 1987 was won by New Zealand, with a side that averaged 14st 3lbs; when the Kiwis triumphed a second time, in 2011, their average weight was 16st 4lbs. It's not just the All Blacks who have bulked up; British rugby players have also piled on the pounds, the average weight of a player rocketing from 13st 4lb in 1962 to 16st 3lbs in 2012. Muscles may have grown but not joints and sockets and nor, more importantly, the thickness of skulls. Hence the alarming concussion rate, and also the reason why international rugby in 2019 bears little resemblance to the sport of a generation ago. In contrast, today's Test cricketer is the same size as previous generations (perhaps with a bit less beer belly) and so are footballers. Gary Lineker, for example, weighed 11 1/2 stone when he led the England attack thirty years ago, and a decade later Alan Shearer tipped the scales at twelve stone. The average weight of the England squad that competed in the 2016 European championships was 11st 8lbs. The players who will be competing in the 2019 Rugby World Cup will be bigger, stronger and faster than their predecessors. Significantly, however, they will also be less talented because the priority today is size and not skill. There are scores of professional players who have freakish physical dimensions but are so muscle-bound that they can barely pass a ball, far less glide through a gap with the same sublime grace as Barry John or John Rutherford, two legendary former fly-halves who would never have made it in today's game because they weren't big enough. Few of the greats from the 70s and 80s would get a professional contract today; not Serge Blanco, the magical French full-back with his 40-a-day smoking habit, or those two lion-hearted flankers, John Taylor and Jean-Pierre Rives, who between them weighed 27 stone, three stone more than the weight of Uini Atonio, the current gargantuan French prop. No country mirrors the sad decline of rugby union's artistry more than France. Once synonymous with flair, Les Bleus are now a team of behemoths who play a one-dimensional rugby devoid of joie de vivre. The number of registered players in France [a medical certificate is required to play] is in free-fall, with registrations in 2018 plummeting from 312,000 to 281,000. Of particular concern is the number of youngsters turning their backs on the game, no doubt at the insistence of their worried parents; between 2013 and 2017, 12,000 players under the age of 14 did not renew their registration. England, Wales, Australia and even New Zealand have also experienced a diminution in player numbers in the last decade. The Auckland and Otago unions both have reported a steady decline in teenagers playing the game with 'a natural resistance from some mothers to allow their children to play contact sport' one of several reasons expounded. Brito's injury, tragic as it was, was an exception and was the consequence of a technical mismatch, a young and inexperienced player in an equally callow team playing against the ferocious and seasoned Tongans. Today the mismatch is physical, and the players being forced out of the game are experienced: between 2013 and 2018, for example, 77 players from the English Premiership retired early on medical advice. The 1995 World Cup in which Brito was injured was the last amateur tournament; the sport went professional a few weeks later and so began its transformation. Players signed full-time contracts and, instead of a couple of evening training sessions each week, they could devote themselves 24/7 to their profession. It just so happened that the 1995 World Cup was the one in which Jonah Lomu, the huge New Zealand wing, made such an impression and ever since rugby has mistakenly believed that big is better. France will host the 2023 World Cup and marketing the tournament will be a challenge if nothing is done to stem the casualty rate. 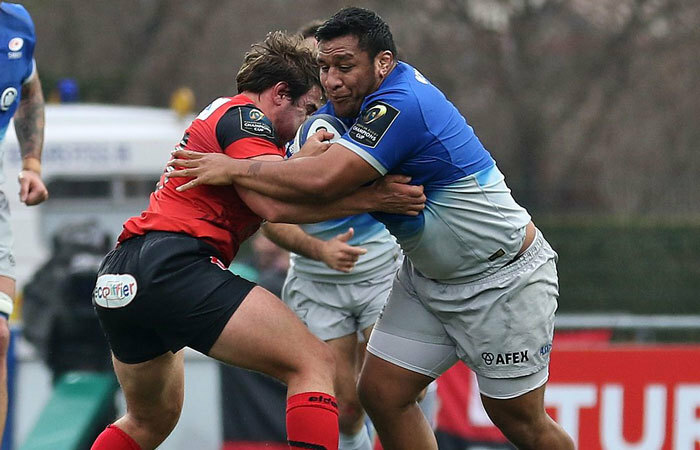 The bottom line is that players have become too big and brutal, and the rules require a major overhaul if rugby is to become, once more, a sport for all shapes and sizes. The French are calling for all tackles above the waist to be outlawed, a radical proposition but one that I support. When I played rugby we were told to run into space, but now players are encouraged to run into each other. Rugby is marketed as the sport of 'big hits and brutal collisions', and anyone who objects to this lurid hype is derided as 'soft'. No – not soft but sensible. Rugby has never been harder and it's killing the sport, and its players.